PHOTO: (Right) Chapel Hill-based food writer and editor Sara B. Franklin debuts Edna Lewis: At the Table with an American Original at the event. Each year, Charleston Wine + Food gives festival-goers a taste of what’s of the moment in food and bev, both on the local and global scale. Cutting-edge chefs whip up creative surprises, balancing worldly spices with local vegetables in dishes inspired by a melting pot of cuisines. But this year, one special event honors the past, paying homage to the woman who brought classic Southern cooking to the national stage. At “The Edna Effect,” taking place on Thursday, March 1 at Alhambra Hall in Mount Pleasant’s Old Village, six chefs are serving up dishes inspired by the cooking of African-American chef and cookbook author Edna Lewis. Born the granddaughter of freed slaves in 1916 in rural Freetown, Virginia, Lewis learned how to cook with goods from the land: wild spring greens boiled in pork stock and served with dumplings, pickled melons from her father’s farm, turtle soup made after a thunderstorm washed the reptiles onto the riverbanks. PHOTO: (Clockwise from top left) Edna Lewis’s recipes are reimagined by chefs Frank Lee of S.N.O.B., April Robinson of the former Butter Tapas, and Mashama Bailey of The Grey. After her father died in her teenage years, Lewis—a statuesque woman, standing nearly six feet tall—moved to New York City, working as a seamstress before becoming friends with Johnny Nicholson, who needed a chef at his Manhattan-based Café Nicholson. Self-taught Lewis stepped into the kitchen, soon gaining a following for her roasted chicken with herbs, buttery biscuits, and cheesy soufflés from the likes of Tennessee Williams and William Faulkner. She also found a fan in Judith Jones, the editor at Knopf who championed Julia Child’s iconic Mastering the Art of French Cooking, who helped turn Lewis’s handwritten recipes into The Edna Lewis Cookbook (1972) and The Taste of Country Cooking (1976). The latter was her most famous work, a tome filled with recipes and stories from her childhood in Virginia. Lewis returned to the South later in life, cooking in kitchens across the Carolinas, including Middleton Place from 1985 to 1987. She passed away in Decatur, Georgia in 2006, at the age of 89. 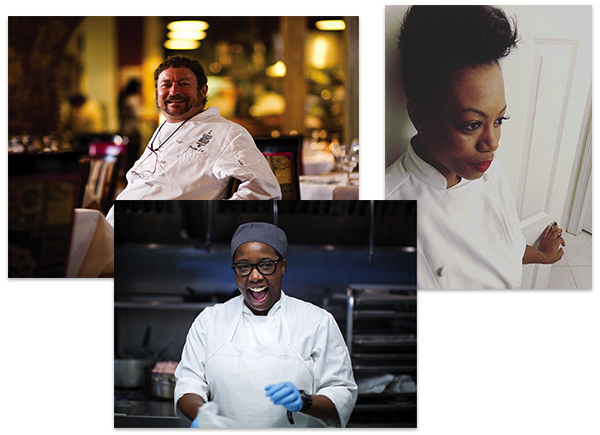 Lewis’s influence has touched many a Lowcountry chef, including Frank Lee, April Robinson, and Savannah’s Mashama Bailey, all of whom will be cooking at the event along with Vivian Howard, JJ Johnson, Toni Tipton-Martin, Duane Nutter, and Jessica Harris. To save your own seat at the table, visit https://charlestonwineandfood.com/events/the-edna-effect/.